Moist to swampy deciduous forests and thickets, river banks, meadows. A rather difficult species to define, and perhaps dubiously distinct from V. sororia, with which it is apparently prone to hybridize, at least in this region. Plants with some pubescence or more rounded sepals or leaves than usual approach V. sororia and may be hybrids. Those with ciliate sepals have been the basis for some reports of V. septentrionalis Greene from Michigan. Hybrids with V. cucullata also apparently occur rarely. MICHIGAN FLORA ONLINE. A. A. Reznicek, E. G. Voss, & B. S. Walters. February 2011. University of Michigan. Web. 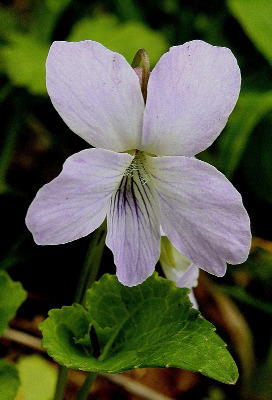 April 21, 2019. https://michiganflora.net/species.aspx?id=2777.